Join us for a totally unique experience seal swimming with New Zealand Fur Seals in their own spectacular environment on Kaikoura's beautiful coast! Snorkelling with wild New Zealand Fur Seals, in the shallow waters of the beautiful Kaikoura Peninsula, truly is a unique experience. It's one of those simple nature experiences that opens your mind to the sheer magnificence of our natural environment and its amazing inhabitants. A breath taking nature activity. You won’t believe how curious, friendly and playful New Zealand Fur Seals can be in the water. This tour enables you to swim or watch the dusky dolphins in their natural habitat. A complete guided commentary is given throughout the trip. 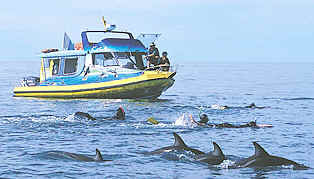 There is an opportunity to swim with the dolphins (all snorkeling and wetsuits are provided) during the tour. All boats are equipped with warm showers and toilets on board. Experience the sensation of getting close to the mighty Albatross, one of the world's largest birds. The skippers have an in-depth knowledge of the seabirds you are likely to encounter while out at sea. Within close proximity of the beautiful Kaikoura Peninsula, range a considerable array of including Albatross, Petrels, Shearwaters, Terns, Shags and Gulls. The photo opportunities are endless - don't forget your camera! Have you ever seen a Giant Sperm Whale up close? 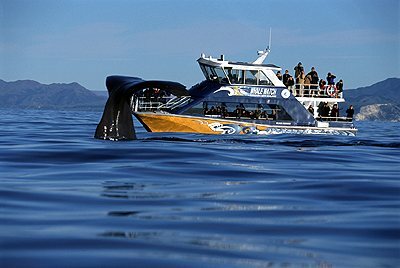 Here is your chance on this whale watching cruise off the coast of Kaikoura. Known for its vast array of marine life, there is also the opportunity to spot Dusky Dolphins, the rare Hectors Dolphin, New Zealand Fur Seals and a wide variety of sea birds. Come and share this breathtaking experience with these magnificent creatures today. Not recommended for children under 3yrs.